For many of us, raising chickens for eggs is one of the most common reasons we decide to bring these birds into our backyards. Avoid breeds that are "good sitters". These breeds have a tendency to go broody, which means they are more inclined to sit on a batch of eggs, waiting for them to hatch. During this time, which may last several months, the chicken will not produce any eggs. If raising chickens for eggs is your main goal, you will want to avoid breeds that have this natural inclination. Select breeds that are hardy for your climate. If you have harsh, cold winters, with short days, realize that production will decrease regardless of what types of chickens you own. However, certain birds adapt better to this type of environment, and will continue laying eggs even in the short, bitter cold months. Consider the age of the bird. Most will not start laying eggs until they are five or six months. When they do start, chickens produce the most eggs during their first laying season. Expect them to reduce their output by twenty percent annually in the second and third seasons. After four years, their ability to lay eggs will significantly decrease. When raising chickens for eggs, also make sure you provide a quality diet, as well as a fresh supply of water. 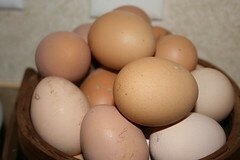 I have laying hens that is starting to eat there eggs after laying there eggs. How can I stop this?